At about 8:30 on another great Wednesday morning, twenty two DNC Birding Brigaders began assembling in the parking lot of Surrey Bend Regional Park, a new destination – although some in the group had explored a gravel access track, now called the Pacific Trail, two years ago after an outing to neighbouring Barnston Island. The park, a huge new 860-acre protected natural area officially opened to the public only in April, contains one of the area’s largest bogs and one of the Lower Fraser’s last remaining non-dyked areas. Its floodplain forests, marshes, and thickets, situated less than five metres above sea level and subject to tidal flows and seasonal flooding, are of high ecological significance. The obligatory group portrait, albeit without camera man Roger and four late comers, was taken in the visitor area with its impressive picnic shelters and well designed playground, complete with climbing poles standing in a huge sandbox. After the photo-op, everyone marched to a nearby viewpoint to gaze at Barnston Island across the side arm of the Fraser. A Tree Swallow and a Flicker in a snag, a cherry-picking Downie Woodpecker and a Cedar Waxwing in a Crab-apple tree were seen and photographed, and then Tom hustled the troop off onto the Parson’s Trail through the riparian woodlands. Soon everyone was spread out along the narrow 1.8km path; a couple of foot-sore stragglers including me, White Rock Al, made up the rearguard. Due to the profuse foliage of the assorted deciduous trees and bushes, a number of Black-headed Grosbeaks, Yellow and Wilson’s Warblers, Willow and Pacific-slope Flycatchers could only be heard. However, one of several Swainson’s Thrushes, an Olive-sided Flycatcher, a Wood-Peewee and a Cowbird were eventually spotted. On an ornate bench built into the railing of a bridge over one of the tidal channels, two resting unidentified individuals were also spotted. After more than an hour of wandering in small clusters or all alone through the dense forest, everybody came together again at the northern end of the much wider Pacific Trail. A quick headcount revealed that no one had been lost in the woods. Because of the now open, unique wetland terrain, it became much easier to observe and photograph species encountered there such as witchying Common Yellowthroats, rattling Marsh Wrens, buzzing Rufous Hummers, soaring Eagles, a cruising Harrier and the usually encountered Sparrows. 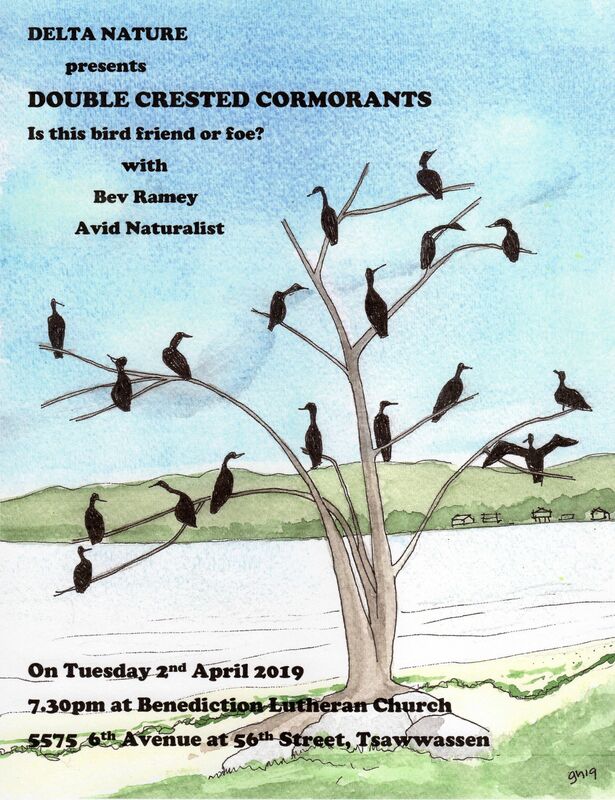 Two cavorting Ospreys were declared the birds of the day until, toward the end of the walk, a Spotted Sandpiper was sighted. Also admired were fluttering Anise Swallowtails and Lorquin’s Admirals. Because more than 4km had been ambulated and the noon hour was approaching, it was decided to forego a quick look at a second site along the Fraser. Instead, most of us settled on another visit to the Big Ridge Pub in Surrey to refuel and re-hydrate. Lunches and brown or blonde beverages were great and the dropping by our table of Tom’s banker son was an added bonus. While the bird species count at about thirty was not as high as had been hoped, it was nonetheless, in Tom’s words, an awesome outing to a new DNCB destination for the following 22 participants: Roy & Solveig, Pat & Maureen, WR AL & Alice, Pascale & Alberto, Debby H & Kathryn, Chris McV & Glen B, Roger & Mike, FIFO Richard H & Dave H, Ladner Jack Mac & Marylile, Jim K & Margaretha S, Richmond Brian A and Tom. 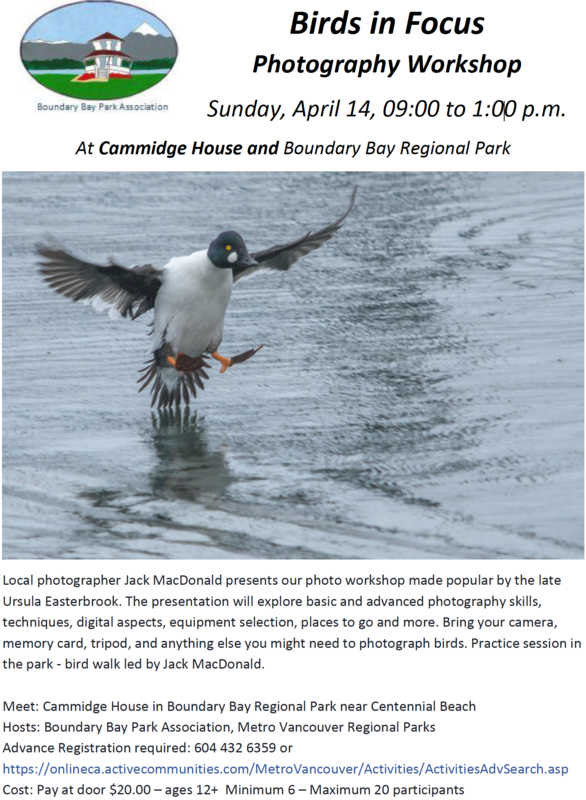 Next Wednesday June 8th will be our quarterly Birds on the Bay outing around Boundary Bay (see poster). Meet at Cammidge House at 9 am. Don’t forget our monthly DNS Meeting on Tuesday, June 7th at 7:30 pm at the Benediction Lutheran Church. 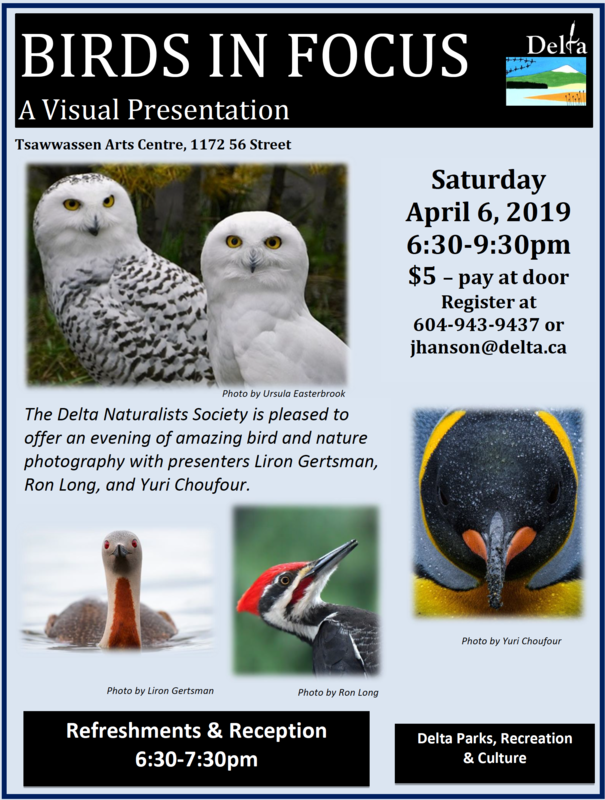 The featured speaker is Jim Morrison speaking on BC Nature – A Bright Future! This entry was posted in Bald Eagle, Northern Harrier, Olive-sided Flycatcher, Osprey, Spotted Sandpiper, Swainson's Thrush, Western Wood-Pewee, Wilson’s Warbler, Yellow Warbler. Bookmark the permalink.